The last few months has proved to be quite an exciting time for social commerce. Off the success of Facebook Advertising and Twitter’s “Buy Now” button, Pinterest and Instagram both announced similar shopping features within hours of each other. So why are marketers going crazy for social advertising? Social media advertising allows businesses to find new potential customers by using users’ shared information to identify interests. 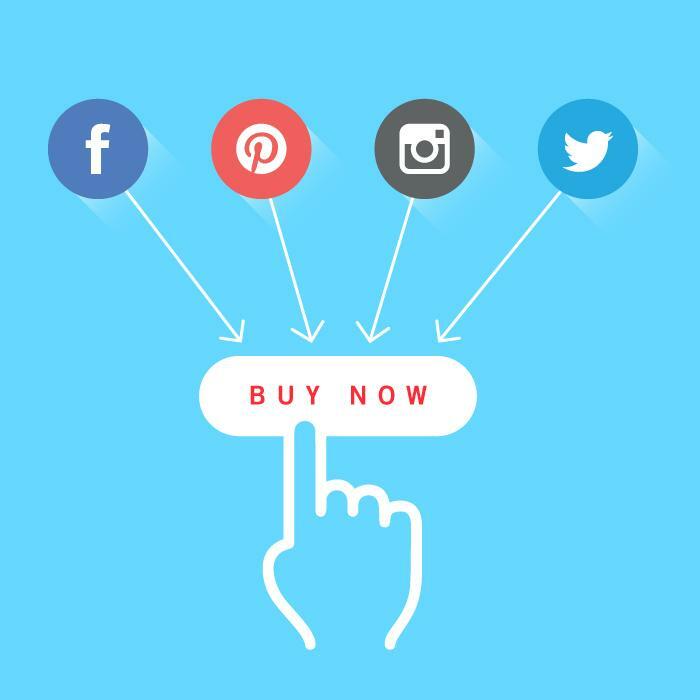 Going beyond general demographics and geographic data, social media advertising has facilitated advanced targeting options like behavioral and connection-based targeting. These advanced targeting methods increase the relevance of the ads and provide a level of personalization that is not attainable on other advertising channels. Mobile users are constantly checking their social media throughout the day, so advertising to them on social media is a great intuitive option. With more and more social media advertising spend going towards mobile, social networks will further establish mobile’s authority as a buying platform. Let’s take a look at how Facebook, Twitter, Instagram and Pinterest measure up against one another when it comes to social commerce, and how marketers and brands can make the most of this social commerce era. When Facebook launched its first advertising option in May 2005, no one could have predicted social revenue would reach $8.4 billion just ten years later. From display ads to video ads, Facebook has become the leading powerhouse in social commerce, and it’s not slowing down anytime soon. Facebook now counts more than 1.3 billion mobile users, and makes 76% of its ad dollars on mobile devices. Facebook’s advanced targeting options allow brands to launch highly targeted ads based on demographics, geographic data, behavior and interests. Taking it a step further, you can also create custom audiences and lookalikes of those audiences. This robust advertising tool allows marketers to amplify the brands targeted reach. Facebook will continue launching new ad concepts. They recently announced future mobile ads with full-screen images and videos, and 360-degree-rotating product images. Facebook has begun testing virtual storefronts on Company Pages, so consumers can shop without ever leaving its app or site. Last September, Twitter launched a “buy” button that let’s marketers drive conversions straight from tweets – a key to Twitter’s mobile commerce future. Most recently, Twitter announced they are testing new product and place collection pages that feature relevant tweets and images, as well as product information such as a description, price, and an option to buy. Twitter ads offer an appealing marketing platform for direct response brands that rely on conversions and performance-driven goals. Twitter also offers marketers tools, such as app installs, click-to-call, and email signups to drive lower-funnel goals. Clicking on a “buy” button on tweets will pull up a landing page where consumers can type in shipping and payment information to easily complete the transaction. Since launching ads a year and a half ago, Instagram has become a powerful mobile platform for advertisers. Facebook, which acquired Instagram in 2012, has kept the mobile photo-sharing service mostly free of advertising, allowing only a handful of big brands to share sponsored messages. That is, until now. Instagram officially announced plans to open the advertising up to businesses of all types and sizes later this month, and recently opened its API to third-party platforms allowing more brands to advertise. Instagram ads will eventually launch from Facebook’s ad buying interfaces, allowing marketers to easily launch both Facebook and Instagram ads from the same platform, and with all the same advanced targeting options. Instagram’s core is visual content that inspires users. With enhanced targeting options, advertisers can target their message in effective ways and reach people not just because of their demographics, but because of the people, places and things they love. Possibly the most important aspect - clickable buttons! Instagram ads feature CTA buttons like shop now, sign up, and learn more, which link directly to a website. This is huge for marketers, since previously the only clickable link has been in the profile description. Pinterest is a strong source of referral traffic, as well as a leading platform for social media shares on the web. Brands’ mobile sales are expected to increase with the rollout of “buyable pins” which allow users to purchase anything they see on the mobile app that has a blue price on it. The buy button shows up on rich pins, which have more information than just a normal pin, with real-time pricing, availability, and more. Pinterest is known for its intriguing (and mostly addicting) scrolling feed that allows users to “window shop” and create wishlist boards. With the introduction of buyable pins, Pinterest is no longer just a shopping list, but a shopping site full of impulse buyers. Buyable pins are simple and secure: when users are ready to check out, they simply tap “buy it” and pay with Apple Pay or a credit card, and once they enter their information Pinterest will store it so users don’t have to enter it in again. If buyable pins don’t fit into your strategy, promoted pins are a great way to expand the reach of your pins. However, promoting a buyable pin is not yet an option. Audiences have an enhanced feedback response, meaning they are able to give negative feedback about ads they see. Ensure your ads are relevant, targeted, and feature quality content. Find the platforms that work best for your brand. If you are a beauty or fashion brand geared towards women, Pinterest makes sense. If you are making a case for a male focused company, Pinterest might not be the best channel. Measure what matters! Engagement metrics are helpful in determining what content is most popular, but your business goals are not driven by the number of likes your Facebook page receives. Don’t forget that the core of social media is to connect to your audience. While social advertising is a common aspect of most social strategies, don’t lose focus on your fans - they are your most valuable customers. It will be exciting to see which platforms pay off the most for brands this year, especially during the holiday shopping season that starts in just a few short months. Published on September 10, 2015 .